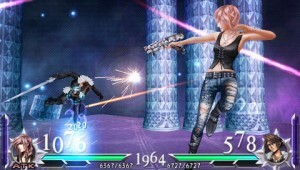 “Dissidia 012 Final Fantasy,” otherwise known as “Dissidia 012,” is a prequel to “Dissidia Final Fantasy,” and it is extremely fun. Square Enix renamed command mode to RPG mode, which is made to make things easier to play for people who aren’t good at the control scheme of action mode. Action mode’s controls are still weird as hell, so it’s pretty hard. On the other hand, unlike most other fighting games, there’s an actual story involved. It’s a pretty interesting one, too. Some of the characters have been redesigned, according to the character information in-game. The equipment system remains the same, as well. In general, the game is pretty fun, especially if you grew up with “Final Fantasy” games. I really like the game, and I might actually buy it. “Dissidia 012” goes for about $30 at Wal-Mart, which I think is worth the money. PS: Kain is still a douche.